Howgill fells and Dentdale, sculptured from Silurian sedimentary strata. P556198. 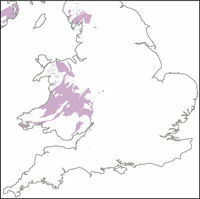 Silurian strata underlie the southern part of the Lake District and much of Wales, with small inliers north of Bristol and along the Malvern Lineament. In the Midlands the Silurian crops out at Walsall and near Dudley, where it forms the local landmarks of Cinder Hill, the Wren’s Nest and Mons. It underlies Dudley Castle and also the Black Country Museum. These are predominantly sedimentary rocks and lack the thick, weather-resisting sequences of the older rocks. They form upland terrain, but the hills are more rounded in profile than the Ordovician rocks (Plate P556198); few volcanic rocks are recorded. Palaeogeographical sketch map of deposition during the mid Silurian. P785837. At the beginning of the Silurian, England and Wales lay at approximately 30º south of the Equator, and the climate was thus warmer than during the Ordovician period. Sediments accumulated in a passive margin basin, which had developed when subduction had shifted and active volcanism waned in the late Ordovician. 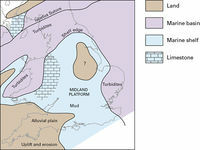 The Midland Platform to the south-east of the main basin may be regarded as a remnant of the stable core of Eastern Avalonia. Carbonate-producing marine faunas flourished in the shallower zones, and the lime they produced accumulated on the shelf or was swept into the basin with the clastic deposits, so that limestone and calcareous strata are more common than in the Ordovician. A gradual rise in sea level that followed the melting of the late Ordovician polar ice cap appears to have continued into Silurian times, accentuating the flooding caused by post-subduction subsidence. The Midland Platform was an area of low relief in the early Silurian, but was gradually submerged remaining as a shallow water shelf (Figure P785837). Thus the volume of sediment supplied into the depositional basin was much reduced as the distance from land increased. Silurian rocks of shelf facies form the escarpment of Wenlock Edge and inliers to the south-west. The formations include the Coalbrookdale (S2), Much Wenlock Limestone (Plate P213679), Elton and Aymestry Limestone (S3) and Whitcliffe, in a sequence that dips eastwards, and reappears near Dudley and Walsall as inliers surrounded by Carboniferous strata. Seismic data suggest that Silurian rocks underlie Triassic strata between the North and South Staffordshire coalfields, but are absent from a large area to the south-east of the Birmingham Fault thus effectively defining the north-west edge of the Midland Platform. Silurian rocks are recorded at depth in East Anglia. Calcareous mudstones of the shelf contain a rich fossil fauna that includes bivalves, brachiopods and trilobites. Reefs, built up by corals, crinoids, stromatoporoids and bryozoans, mark exceptional periods of carbonate accumulation in the early and late Wenlock. In south-west Wales reef carbonates are absent, probably as a result of more abundant clastic input from the nearby landmass to the south. Deltaic and shallow marine silt and sand comprise the shelly and calcareous Coralliferous Group and overlying sandstone (S2; S3). Turbidites of the Aberystwyth Grits exposed at Harp Rock, Upper Borth. P008157. Fluvial sandstone and siltstone of the raglan Mudstone Formation, Herefordshire. P667875. In central Wales, several kilometres of sediment accumulated throughout the Silurian, generally in a deep-water marine setting. A mix of sand and mud formed most of the basin fill, transported by turbidity currents and dumped on the slopes and floor of the basin. The Cwmere Formation spans the Ordovician–Silurian boundary (S1) and is overlain by the Claerwen Group; both are largely fine-grained mudstone turbidites. 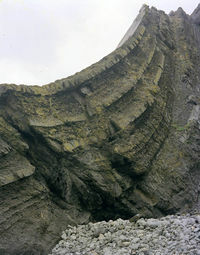 The coarser turbidite systems in Wales, the Aberystwyth (Plate P008157) and Cwmystwyth grits groups (S1) are mid Llandovery, and the Denbigh and Penstrowed grits (S2) are Wenlock in age. Sediment was carried into the basin mainly from the south-west, but there is a well-defined pattern of local turbidite fans that built out from the basin margin. Between the influx of turbidites, a continuous ‘rain’ of mud from suspension and the remains of dead organisms accumulated forming delicately laminated hemipelagic mud. When stagnant, oxygen-starved (anoxic) sea-bed conditions prevailed in the basin, the mud was left undisturbed and formed the perfect medium for the preservation of graptolites and fragile orthocones. On the slopes and shelf where oxygen levels were higher, the lamination was destroyed by the activity of burrowing organisms and only bioturbated beds are preserved (Plates P649398 and P649399). Anoxic and oxic conditions each dominated at various times, and have been linked with a number of major transgressions and regressions: the changes in sea level that were first recognised in the shelf successions. Much Wenlock Limestone, a thinly bedded nodular limestone, Vinesend quarry ner Malvern. P213679. Disturbed beds in the Elwy Formation (S3), of Ludlow age, north Wales. P007969. Bishop's Frome Limestone is a rubbly calcrete at the junction of the Raglan Mudstone Formation and St Maughans Formation. P007651. Slump beds or mudflow deposits are a characteristic feature of the Silurian strata of the Welsh Basin. They reflect instability and may be related to specific events such as submarine slope failure, storms or the effects of earthquakes on the basin-margin faults. In the early years of stratigraphical research in the Denbigh area, they were mapped as ‘disturbed beds’ (Plate P007969) within the Denbigh Grits, Nantglyn Flags and Elwy formations (S2; S3). The disturbed beds are more resistant to weathering and stand out as marked topographic features, and thus helped to unravel details of an otherwise repetitive mudstone-wacke sequence. 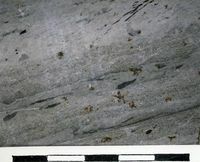 On the Isle of Man, the Dalby Group (S1–3) is Wenlock in age and dominated by turbiditic sandstones with some thinly laminated hemipelagites. In the Windermere Supergroup of the Lake District, the Stockdale Group (Llandovery) and Tranearth Group (Wenlock) are the equivalent basin-fill sediments (S1–3). 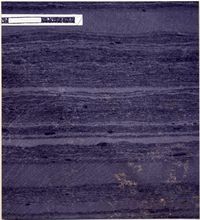 Laminated hemipelagite dominates in the Wenlock and early Ludlow strata. 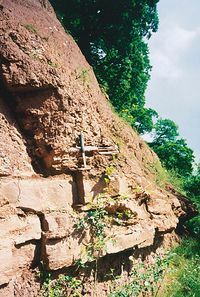 Turbidites increase toward the top but the main turbidite event was in the Ludlow, the Coniston Group (S3), which is thought to mark the cataclysmic events associated with the collision of Laurentia with Avalonia, when the rate of subsidence was accelerated. The Kirkby Moor Formation (S3–4) reflects a slower rate of subsidence as isostatic adjustment occurred. The group consists mainly of mud-dominated turbidites and is succeeded by shallow-water siltstone and postorogenic red beds. Hemipelagite and turbidite mudstones, laminated. P649398. Hemipelagite and turbidite mudstones, burrow-mottled. P649399. The red beds are a continental facies known as the Old Red Sandstone, and are better developed farther south in the West Midlands and in Wales where over 4000m are recorded in Pembrokeshire. In late Ludlow and Pridoli times, the depositional environment became shallower and basin inversion eventually led to uplift, erosion and deposition of the continental red beds. Most of this facies is of Devonian age, but the Lower Old Red Sandstone, the Downton Subgroup (S4), is now part of the Pridoli Epoch and forms the outcrop along Mynydd Epynt and the Black Mountains. At the base it includes distinctive yellow-brown sandstone of the Downton Castle Sandstone Formation (up to 50m thick) and the grey-green Tilestones and Temeside Mudstone formations (together usually less than 50m thick) that were laid down before full fluvial/continental conditions were established and the Raglan Mudstone Formation was deposited. The base of the Tilestones Formation is traditionally taken as the local base of the Pridoli, but is likely to be diachronous. The Tilestones consist of laminated and cross-bedded sandstone that accumulated as beach and barrier sands, marking the end of fully marine environments in the Silurian of Wales and the Midlands. The Temeside Mudstone Formation is a regressive facies of dull green siltstone with calcrete nodules and sandstones, interpreted as the deposits of a lagoon or tidal flat that dried out occasionally allowing carbonate soils to form. The Raglan Mudstone Formation (Plate P667875) forms the main part of the Downton Subgroup and becomes coarser towards the top, as the environment of deposition changed from coastal plain to alluvial plain and alluvial fan. The formation comprises over 1000m of red siltstone with thinner cross-bedded sandstones in a broadly cyclical pattern that includes numerous calcretes—soil carbonates that formed as the alluvial floodplain dried out and soil horizons developed during periods of exposure. A particularly thick and widespread calcrete is identified at the top of the formation (Bishop’s Frome Limestone Member formerly the Psammosteus Limestone) (Plate P007651) and has been mapped over a large area. On Anglesey to the south of Dulas Bay and Lligwy Bay, the succession (D1) records the burial of a palaeovalley that was separated topographically from the main ‘Anglo-Welsh basin’ for at least the early part of its development when a number of coalescing alluvial fans were banked against the valley sides. Otherwise, the lithologies are similar to those of the Raglan Mudstone Formation and include a thick mature calcrete. Volcanic rocks of Silurian age are found in south Wales. The Skomer Volcanic Group (S ) in Pembrokeshire consists of mafic lava flows that were extruded on land, and occur with breccias and sedimentary rocks (S2) that originated in the coastal zone. Eastwards at Maesteg, rocks of similar composition have been found in a borehole, and cobbles of similar volcanic material are found in the Old Red Sandstone conglomerate (Llanishen Conglomerate) between Bridgend and Cardiff. Lavas are also found in the Tortworth inlier near Bristol and in the Mendips. Very thin layers of fine-ash tuff are an inconspicuous but widespread feature of the Silurian strata. Most are no more than a centimetre thick, but one widespread horizon in the Downton Subgroup is a composite bed up to 4m thick that forms a useful marker, and has been named the Townsend Tuff. The ash that formed these layers may have travelled some distance: we know, for example, that ash from the 1883 eruption of Krakatoa in Indonesia fell on Singapore some 840km away and is reported to have fallen on board ships up to 6000km from the volcano. This page was last modified on 28 July 2015, at 17:03.